It is fairly obvious that the narratives in Vǫluspá and Baldrs draumar resemble these two patterns in some respects, but that they do not altogether fit into them. In Vǫluspá st. 22 we encounter another vǫlva called Heiðr, who is usually supposed to be a transformation of a figure called Gullveig (apparently one of the Vanir). I think this is a mistaken interpretation, and that Heiðr is more probably the narrating vǫlva of the poem. The name also appears at the end of Hyndluljóð 32, among a list of giants of both sexes, where it is immediately followed by a line about the mythological ancestry of völur. This poem (or at least this section of it) is referred to by Snorri as Vǫluspá in skamma, and it shows clear textual echoes of the longer Vǫluspá; for its poet, Heiðr was clearly a giantess (like the narrating vǫlva of Vǫluspá) whose name prompted a line about völur in general. Whether we give the narrator of Völuspá a name or not, she was brought up (or brought forth) by giants and remembers nine worlds (st. 2) - probably the nine worlds of the dead, into which human beings die out of Hel, according to Vafþrúðnismál 43. She is paid for her prophecy with hringa ok men (st. 29). Her magic is performed in a trance (leikin, st. 22) and her prophecy is delivered in vatic fornyðislag verse to a patriarchal figure, in this case Óðinn; it represents a truth which she `sees' (the verb is also used by the völur called Heiðr in Hrólfs saga and Örvar Odds saga), and one of her refrains - vitu› ér enn, e›a hvat? - is echoed several times by the giantess Heiðr in Hyndluljóð (viltu ennlengra? )50 and once by the enchantress Busla in Bósa saga (e›a viltu flulu lengri?). The patriarch has three sons (by different mothers, so that they are half-brothers to each other) who figure in a central episode of the action (the killing of Baldr and the revenge for it). The vǫlva's prophecy includes the death of the patriarch figure (though not at the hands of his sons), and fire is involved, although it is not the actual cause of his death. fláttr); raising up a dead man to discover the future (Saxo). Ynglinga saga ch. 13 (and Ynglingatal 3, narrative verse,fornyrðislag). 43 ed. Finnur Jónsson, 20-1; Flateyjarbók I, 81-2. ***Turville-Petre's suggested identification of Gullveigr with Freyja was based on Dumezil, whose eagerness to force all of Norse mythology to fit into his tri-functional model has been rapudly losing support over the past couple of decades. For a good review and critique of this and other theories, see the entry for Gullveigr in Rudolf Simek's "Dictionary of Northern Mythology," pp. 123-24. A novel theory which I find intuitively appealing was advanced by Lotte Motz in her 1993 article, "Gullveig's Ordeal: A New Inter -pretation," ANF vol. 108, pp. 80-92. Based mainly on etymological clues, Motz hypothesized that the reference to Gullveigr's repeated deaths in Vǫluspa was an early form of the "John Barleycorn" folk motif - and Gullveigr is a personification of the golden mead of the gods. No relation to Freyja. Hel no! 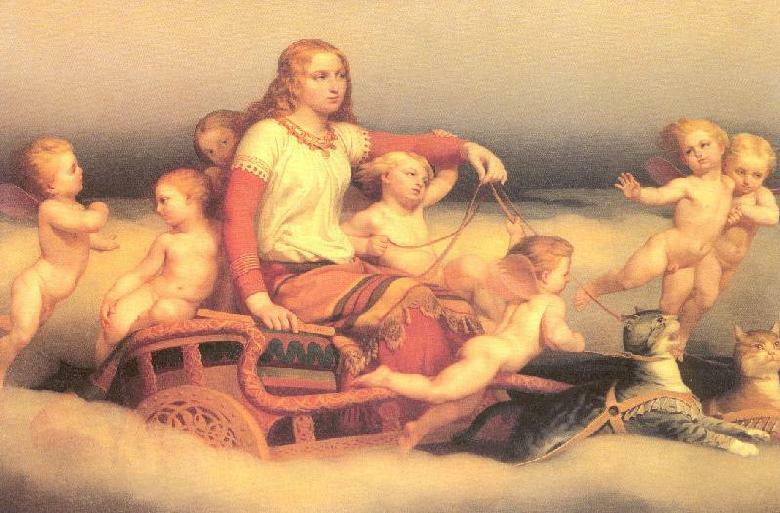 Müllenhoff, and modern scholars like Gabriel Turville-Petre suggested that Gullveig is also a name for the goddess Freyja. In my view sadly, this myth has been passed around internet forums for decades but here follows a learned opinion. Since Snorri says that Freyja brought seid to the Æsir, many scholars have assumed that Gullveig/Heid is actually Freyja, one of the Vanir, and that her corruption of the Æsir precipitated the war. The stanzas sequences in Voluspa 21-24 are IMO anything but clear? The suggestions however may lead to a false conclusion that a character calledGullveig or possibly Heid entered the arena on what was war on folk/ people/ army....the descriptions vary depending on whose take you happen to support. We also have to remember that Snorri's ultimate goal was to preserve the "prose" and not the lore actual and there is a subtle difference. It seems to me that both linguist, scholars and enthusiasts have all fallen into the trap of assuming Snorri preserved the lore he did not! Snorri preserved prose. And we all know that prose is very open to broad interpretation and has no real historical time line. It is by far much more likely that these events were totally separate incidents over a vast expanse of time centuries perhaps that was fused together into fragmentary prose to make poetic sense. Turville-Petre's suggested identification of Gullveigr with Freyja was based on Dumezil, whose eagerness to force all of Norse mythology into his tri-functional model has been rapidly losing support over the past couple of decades. For a good review and critique of this and other theories, see the entry for Gullveigr in Rudolf Simek's "Dictionary of Northern Mythology," pp. 123-24.